Let's explore what it takes to write a book. Keep in mind that there are many different ways to begin writing a book and there have been many books written on the subject. So if my article hits home in even a little way... research what's out there for more information and start today... following your dream! 1. What are your strengths, creating, developing, writing, editing, or sales and marketing. Take your best strength and begin there and figure out how to get the rest done through other vendor services. 3. Pick a subject that is interesting to you, something that others will be interested in learning more about and make it tightly focused for best results. Maybe you have a business service you want to promote or a new profession you are learning about and want to share the knowledge you are learning. 4. Create an outline of frequently asked or interesting questions. This becomes your table of contents that you'll write into. 5. Start collecting all types of information that relates to your outlined points. One of the best ways I've used is to create a three ring binder with divider pages that have pockets or use plastic sleeves and start organizing your clippings or notes you take as thoughts come to you. 6. Now determine if you are going to be the one to do the actual writing or are you going to hire an assistant. This is the first step for creating your final manuscript. Whether you are the one who will do the writing, or someone else, start that process once you have gathered enough research to fill a chapter. Don't worry yet about writing in sequence unless this is important to you, the flow paragraphs can come at a later version. These are just a few beginning tips to get you started. While you are in this creation mode, be sure to keep an eye out for possible titles and subtitle opportunities as well as design elements you like that other authors have taken advantage of... these are all input you can relate to your book cover designer when the time comes to design your book. Keep doing something every day towards your book and promotion! Online PR 101 and get free MP3 from Pam Perry on "What Every Author Should Know"
I get calls and emails all the time from Christian authors who "want to get out there." Though I appreciate their zeal, I want to really get them in gear for what "real PR" looks like. It's not automatic that 10 million people will be knowing your name and Oprah is calling you. You have to know a few things about PR, branding, social networking and book marketing - that's why I'm doing this blog. So, watch this video and go to www.PamPerryPRCoach.com and get the free tip sheet on "How to Become a Best Seller" in the Christian market and also request the free MP3 on "What Every Author Should Know"that I did with the help of Bob Ivory of Ivory Coast Media. I'm just trying to help those who are the carriers of God's Word - the scribes who want to market the message to the masses. It's my mission and my passion. And read the blogs of my friends on my blogroll too! Let's do it with excellence, OK? Study to show yourself approved. Make sure you see http://www.PamPerryPR.com and join the new social network for Christan Authors at www.ChocolatePagesNetwork.com too! Build An Audience For Your Book With A Blog - Even Obama had one and a Twitter, Facebook & Myspace! Shhhhh. I've got a secret to share with you that you may not even know about. In fact, if you have ever written a book or thought about writing a book, I'm gonna let you in on something that won't cost you a dime of money, but could produce an incredible opportunity to effectively market your work. What is this dream plan for building an audience of enthusiastic buyers for your book? Simply put, it's a blog. What's that?! A blog, short for weblog, is a web site journal where you can post just about anything you want about whatever subject matter interests you the most. For me, after losing 180 pounds on a low-carb plan in 2004, I knew I had found a topic that I was very passionate about sharing with others and that there would be an audience who would be willing to listen. In April 2005, I started my "Livin' La Vida Low-Carb" blog located on the Internet at http://livinlavidalocarb.blogspot.com. When I first started my blog, I had just begun work writing on my book, also called "Livin' La Vida Low-Carb." The early days of a blog are kinda like being on a 100-watt radio station out in the middle of nowhere. You talk and talk and feel like nobody's listening. And if you expect to find instant success with your blog, then just don't bother. But if you write freely about what is in your heart, share openly and honestly about what's on your mind, and provide relevant content that people will want to read, then you will begin to build an audience who will follow you and want to come back for more. To let others know about my blog, I went to other similar kinds of blogs and web sites to introduce myself and to let them know about what I was doing. I probably posted my URL on about 50 different low-carb message boards to get the word out about it. In my first month online, I had about 5,000 pageviews. By the third month I was online, the pageviews at my blog grew to 10,000 that month. In the meantime, I continued to post articles on a daily basis to keep the web site looking fresh and new all the time and I bought the domain name for my book, LivinLaVidaLowCarb.com. I had the domain forward all of the traffic to my blog. This is an excellent way to build those repeat readers by making it easy for them to find you, and the faithful will come back to you often. Whatever you do, don't just suddenly stop posting to your blog. Nothing frustrates a reader more than to come to your blog for three or four days in a row with zero updates. Some people may wonder if you've gone away forever and may never come back. Don't leave 'em hanging. If you can't post for a few days, then let your readers know it. When my book debuted six months after I began my blog, I was getting about 15,000 pageviews per month. This built-in audience for my book gave me an instant marketing strategy to provide them with an additional resource for information about low-carb, something that I had already been providing them at my blog. Since they knew my writing style and felt confident in my ability to write, I noticed that many of my blog readers began buying my book. While that was not my sole purpose in creating the blog, it certainly didn't hurt to build an audience that would be receptive to my book when it was released. In the three months since my book has been released, the pageviews at my blog have simply skyrocketed. November and December each had 20,000 pageviews and the month of January is expected to easily surpass the 30,000 pageview mark. WOW! I would have never thought something free would ever bring about this kind of success. But it has and you should learn to capitalize on it, too. Don't be afraid to stir up a little controversy in what you write. Readers like to root someone on who is willing to fight for a cause they believe in. No matter what the subject content of your book may be about, there is always an audience looking for a leader. Be that leader! Don't be afraid to change the format of your blog often so the web site looks like you are working hard on it -- and you are! Also, don't be afraid to market your book front and center at your blog. You are providing your readers a service by imparting information to them. Many of them will reward your consistency at your blog by getting your book and telling others about it, too. One of the things that helped me grow my blog was when other blogs posted links to articles I had written. This brings in many new readers who would have otherwise never come to your web site. Feel free to do the same for anything you see on someone else's blog. You can even post a permanent link to their blog which many will reciprocate with a link to yours. Building this community of readers can and will help you market and sell your book. I have had the fortune of having three fully-paid speaking engagements/book signings in Huntington Beach, CA, Milwaukee, WI, and Brooklyn, NY in the past two months because key people discovered me and my book thanks to the work I invested at my blog. Never underestimate the power of this invaluable tool for building a growing audience for your book. Online social marketing media made this victory possible. In his acceptance speech, Obama thanked us all for helping him win the election. This includes the people on the viral web and his social web marketing campaign. On blogs everywhere, surfers throughout the Internet have been posting updates and information about the election. Some have taken it to the next level by using Twitter, FaceBook, YouTube and other forms of social media. These online tools all worked in sync to spread a message of change and inspired us all to vote on November 4th. Moving into the future with a new President who calls for change, isn't it time you did the same with your online business? It is no surprise that Twitter users were among the first to know who won the election. Even Obama has a Twitter. Throughout his campaign he acquired close to 120,000 followers, keeping them updated on campaign trails and rallies. Many of his tweets included links to YouTube videos of all his appearances. This video, as well as many others, was shared, posted and promoted on many blogs, social profiles and websites. 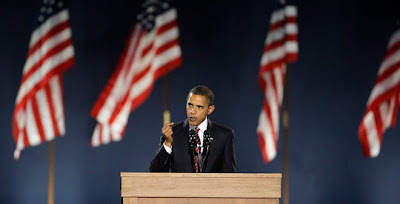 On Facebook, Obama and his team created fan pages and widgets for supporters to donate to the cause. Twitter, FaceBook, YouTube, a website and a blog, talk about a candidate who uses all alleyways and avenues to get his voice heard. With these tools, the buzz spread on its own and prompted visitors to "take action." The social web was a huge factor in making the Obama campaign go viral. Social web marketing probably saved the campaign millions of dollars in additional advertising. What does this tell us? You can make your online marketing campaign go viral as well. With patience and a well-planned marketing strategy, you can use social media to your web success. Online marketing is the present and future of advertising. As we enter a new era, expecting monumental changes within our government, economy and American lifestyles, businesses need to focus their marketing strategies and step into the web. The Web Success Team http://www.websuccessteam.com specializes in SEO and SEM to build and market direct response websites that take full advantage of the latest developments on the Internet. The Team has an arsenal of effective web strategies, online tools and proven techniques to promote your products and services. And we'll show you ways to increase the amount of qualified traffic to your site through the expanding "social web" and how to convert visitors into buyers at a high rate of return. One of the most effective methods for promotion is media exposure- exposure that starts from a simple press release. Newspapers, magazines and television news shows rely on press releases to locate news and human interest stories. Anyone can send a press release, but in order to get the attention of reporters, it must be professional, news worthy and appealing to a broad audience. A press release should be brief- one or two pages- yet include enough details that a reporter could write a short article based solely on the information provided. The release should not be an announcement that a business or product simply exists, but should have an enticing “hook”. Good hooks include special events and sales, product announcements, contests, survey results or awards given or received. The trick is to make the hook interesting enough to capture the interest of the reader. ¨ Read several sample press releases before writing yours so you understand the proper format. www.BusinessWire.com and www.PRNewswire.com are good sources for locating professional releases. ¨ Start with a proper heading that includes your contact information. When listing phone numbers, indicate a day and evening number (reporters may call at odd hours) or simply list your cell phone number. ¨ Give the release an enticing title that captures the reader’s interest and print it in BOLD type. ¨ Double space the body of your release for easy reading. ¨ The first paragraph should include the basics of who, what, where, when and why. You want to lay the foundation and include your hook immediately. Remember that you want to engage your audience and prompt a response from the media. ¨ Determine the purpose of your press release. Is it to announce a grand opening, special event, introduce a new product or share valuable information with the public? Include the key points that make your story interesting. ¨ Use quotes from business partners, clients or other professionals to give the story more color and credibility. As awkward as it may be, you may want to quote yourself- especially if you are the subject of the release. ¨ Close with a brief summary of the business or the person you are promoting. ¨ Do not allow grammar or spelling mistakes to sneak into a press release. Make sure you edit your writing thoroughly and have a friend- or better yet two friends- review it for errors and content. If you want to send your press release out locally, start compiling a list of media contacts. Check the websites of your local newspapers, news programs and magazines for contact names and address information. Media outlets accept press releases by mail, fax or email and typically indicate their preferences on the website or publication masthead. If you can’t locate press release instructions, it is best to mail it directly to the appropriate editor for your topic. There are numerous services that you can pay to distribute your release to hundreds or thousands of markets. A few to investigate are www.ereleases.com, www.prweb.com, and www.xpresspress.com. Before you send your release, be sure you are prepared to answer interview questions. You may receive calls from reporters immediately and will want to have thoughtful responses ready. Consider writing a list of points you want to make and keep it handy. Most people find that a press release can be worth its weight in gold since a news story usually generates more buzz than any form of paid advertising. Don’t be discouraged if your first attempt doesn’t receive the attention you want, simply try again until you find the formula and pitch that works. Stephanie Chandler is a small business expert and the author of FROM ENTREPRENEUR TO INFOPRENEUR: MAKE MONEY WITH BOOKS, E-BOOKS AND INFORMATION PRODUCTS. She is the founder of www.BusinessInfoGuide.com, a directory of resources for entrepreneurs and www.ProPublishingServices.com, a custom writing business specializing in electronic newsletters, information marketing, and sales copy for websites and brochures.